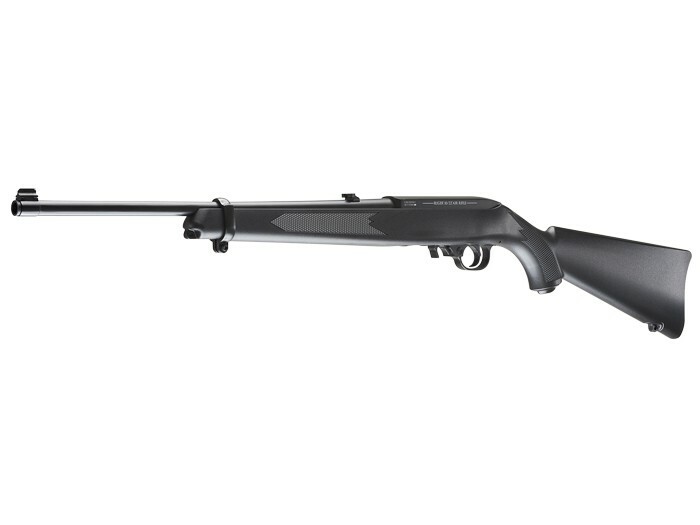 The Ruger 10/22 is an iconic rifle that has introduced countless shooters to firearms. Thanks to Umarex, the 10/22 is now available as a CO2 powered pellet rifle! With almost identical phyiscal specs and characteristics to the .22LR rimfire rifle it's modeled after, this rifle is sure to be a hit in backyards everywhere. A 10 round pellet magazine seamlessly loads into the rifle, and two 12 gram CO2 cartridges in the rear of the stock send pellets to their target at speeds up to 650 fps. The 10/22 is likely to find fans in new shooters and replica fans alike due to the light overall weight and authentic features. Maybe the most intriguing feature is the trigger. While the 10/22 has a 10 lbs double action pull, simply cocking the charging handle on the rifle turns this into a single action trigger and reduces the weight to 3 lbs. This feature makes the rifle more user friendly and should aid in the overall accuracy. How many Magezines come with this rifle? Any possibility of a 22 caliber in the future? The gun was just announced at SHOT show last month, the future is full of possibilities, who knows.